Here is a continued look into the most common insect pests in Gilbert, Arizona. You may have encountered these pests before but should you be worried? Let’s take a closer look at these insects and if they pose a danger to you or your home. The bark scorpion is found in the dry, rugged terrain outdoors in Gilbert. They tend to stay hidden within rocks and crevices within the dirt. They are easily identifiable for their long, narrow body and claw. Although they are smaller in size, the venom is still poisonous and will cause extreme pain. This striped tail scorpion may be found beneath the ground as the burrow to create their homes. However they also burrow in areas in your home or garages such as in clothing, shoes, and storage boxes. The striped tail scorpion can be identified by their wide, thick body and claw. Varsity Termite and Pest Control provides a scorpion control in Gilbert. Homeowners commonly mistake the Arizona brown spider as the common house spider. They are brown in color with darker brown markings on the head. This venom is extremely dangerous for human. The venom eats away at flesh tissue and may cause more severe damages to your health. The female black widow can be identified by her black body and red stomach. She can be found hiding in darker areas or spots where she will not be disturbed. The female spider will not attack but will bite if provoked. She does possess venom but it is usually non-threatening. Similar in size to the tarantula the crab spider likes to make its way into the home. It will make a resting spot for the winter months on walls or ceilings. They do bite but nothing life threatening will ensue from this bite. Tarantulas can be found in Gilbert but it’s likely you won’t see them in your home. They can be found most commonly during mating season in the mid summer months. They will bite if provoked but do not possess any venom or life threatening poison. Drywood termites live in wood with low moisture levels and, unlike subterranean termites, drywood termites do not need to surface from the home. Since they live in this wood it is easy for these termites to be transferred to new areas. If the wood is too warm it will kill the colonies so they termites tend to stay in dark, or interior spaces. Keep an eye for small pellets; these pellets are left by larger colonies, and a clue your home is infested. 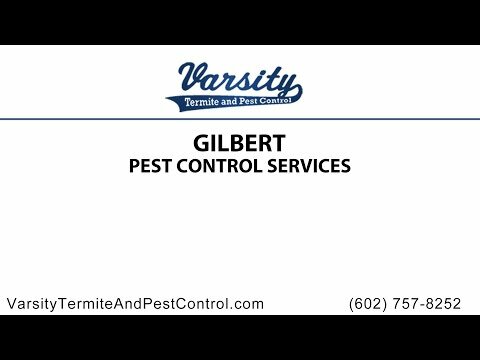 Varsity Termite and Pest Control also provides a termites control in Gilbert. There are many varieties of wasps and hornets, although some seen in the valley more than others. Your common house wasp is the paper wasp. These wasps will build their colonies during springtime, but will not be harmful to you unless provoked. The yellow jacket, cousin to paper wasp, are not as commonly seen. If you spot one they are usually trying to steal food during lunch in the park. They are more aggressive and will attack if threatened. Call Today for more information about pests and pest control in Gilbert.